Does anyone else feel like there is just not enough time in the day? I've always felt that way, but this school year it has gotten even worse. The girls have something going on every day after school. Between eight dance classes, soccer practice, volleyball practice, homework, and games there is just not much time to be planning and making dinners. I'm always excited to find a new recipe to add to the rotation that is both easy and yummy! 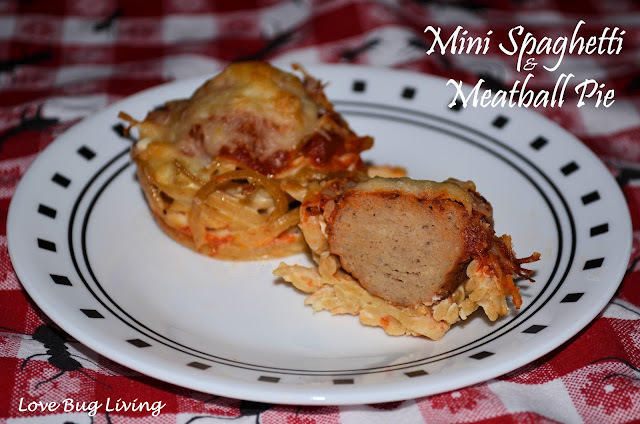 I think we may have done that with this Mini Alfredo Spaghetti and Meatball Pie! I made these Mini Meatball Spaghetti Pies with leftover Fettuccine Alfredo. 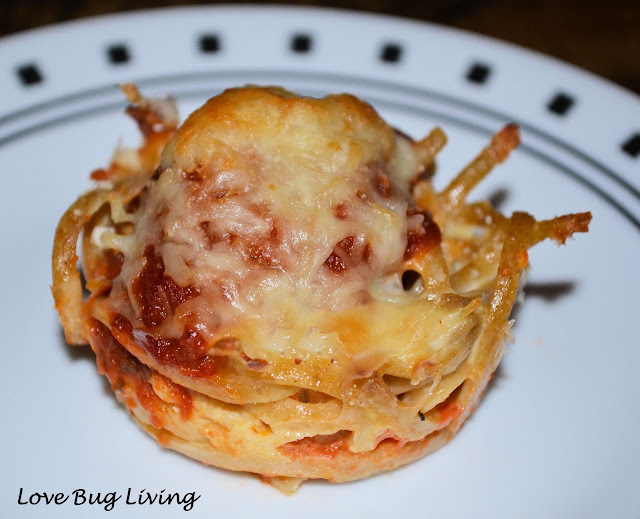 I didn't think I'd have enough pasta to make a large spaghetti pie, so I divided what I did have into a muffin pan. 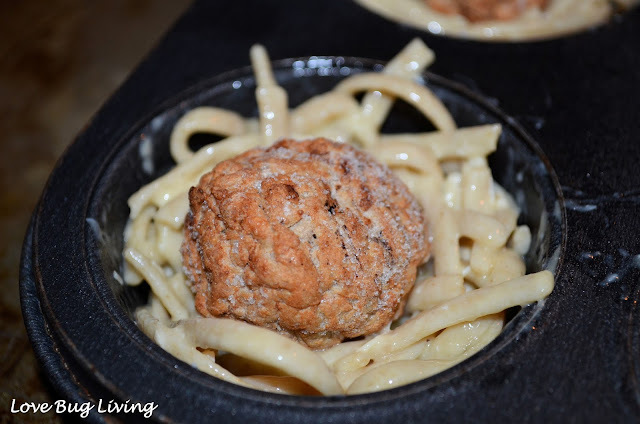 I used frozen turkey meatballs to make the process even quicker and a bit healthier. After preparing the pan, I covered it and kept it in the refrigerator until I was ready to bake the spaghetti pies. Combine your cooked pasta with your Alfredo sauce until combined. If your pasta is still hot, keep stirring until it has cooled. Beat your egg in a small bowl and then add to your pasta. Stir until coated. Grease or spray your muffin pan. 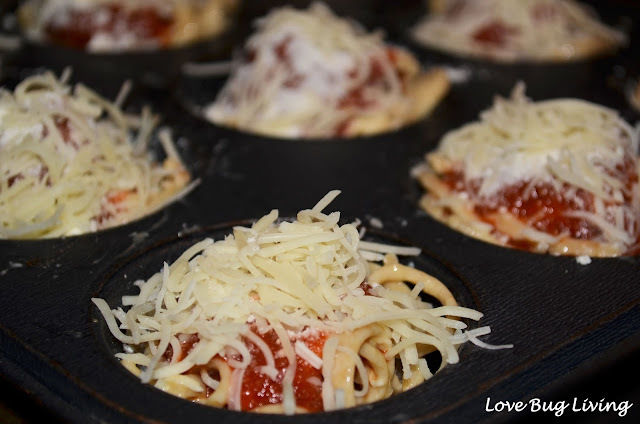 Divide your pasta into your muffin pan cups. Add one meatball on top of each cup. Spoon 3-4 tablespoons of marinara sauce on top of each meatball. Top with your mozzarella and parmesan cheese. Bake in a 350 degree oven for 20-25 minutes or until cheese is light brown. Let stand for 5 minutes before serving. Slide knife around edges to remove. Enjoy!